Radeon® Xpress 200M is the industry’s first PCI Express® chipset for notebooks with Intel® Pentium® M, Intel® Celeron®, Celeron® M and Intel® Pentium® 4 processors. Radeon® Xpress 200M is a highly versatile chipset that appeals to a broad range of notebook designs including thin and light, performance thin, and desktop replacement. Best-in-class PCI Express® performance with built-in DirectX® 9.0 graphics Radeon® Xpress 200M offers a graphics core that is a derivative of Radeon® X300 technology. It is the fastest DirectX 9.0 integrated graphics platform for Intel-based PCI Express® notebooks, offering high-performance graphics for digital multimedia applications and 3D games. Systemax’s striking new dual 15-inch TFT LCD monitor offers a contemporary, budget-pleasing alternative to those large CRT monitors that occupy way too much desktop space. By connecting two 15-inch LCD monitor panels side-by-side on a single base stand, the designers and engineers at Systemax have crafted a panoramic monitor that occupies a reasonably small space. Plus, the digital specifications onboard this spectacular dual monitor are superb all around. 2048 x 768 resolution. 250 cd/m2 brightness. 400:1 contrast ratio. 0.297mm pixel pitch. Crystal clarity. Stunningly realistic images. Text that stands out to such magnitude that you’ll think you can take it off the screen with your fingertips. Depending on your taste, the Systemax DS 1500BSY can be easily installed on a desk or wall-mounted due to its simplified, slim flat design. The DS1500BSY’s exceptional ergonomic efficiency will improve your natural perception and ability to multitask by employing a primary "focal point" screen as well as a second screen for supporting peripheral vision. No More Time-Consuming Monitor Switching The DS1500BSY relies on an economical, easy-to-use technique to seamlessly display as much data in merely 15-inches of screen as can be seen on a single 20-inch LCD monitor. Your view of programs will take on instantaneous clarity, a dramatic upgrade from the way you’re used to seeing text and graphics. Those days of having to switch between programs or document windows on your crowded desktop space are over! 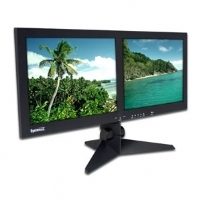 Unlike large-screen monitors that often sacrifice viewer-friendliness in favor of added desktop space, this Systemax dual LCD monitor offers crystal clear images in a large format you can easily see. Best of all, the price tag on the DS1500BSY is incredibly low?especially when you consider that you’re maximizing productivity to such a daring degree. Our Systemax DS1500BSY dual 15-inch LCD monitors have quickly become one of our hottest selling new items.